Attention garlic lovers: This is your day. Today is National Garlic Day, a celebration that salutes that key ingredient for so many fantastic cuisines. The pungent cloves are crushed, roasted, minced, sliced, and liquefied in a wide variety of dishes, from Thai to Chinese to Italian to Mexican, and everywhere in between. To celebrate here on Local Food Journey, we’ll share some fun facts about garlic and a classic garlic dish, the famous 40-clove garlic chicken. 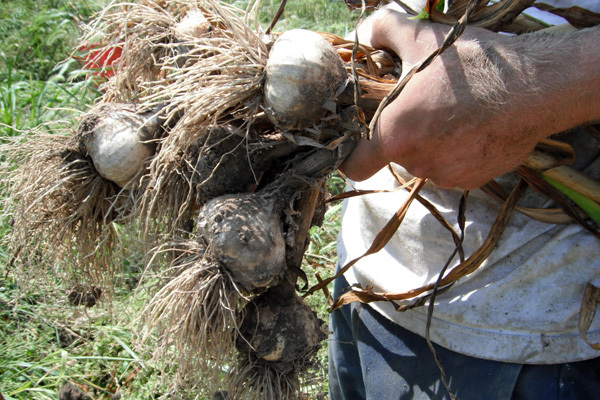 - Native to central Asia, garlic has a lengthy history dating back 6,000 years. - Garlic was a commonly used seasoning in the cuisines of Africa, Asia, and Europe. - The Egyptians are said to have fed the herb to workers building the Great Pyramid of Giza because they believed it boosted their stamina. - In the Middle Ages, plague-phobic Europeans ate whole cloves of garlic to fight off the scourge known as the Black Death. A perfect dish to serve on National Garlic Day is one that has enough garlic to make you immune to the Black Death and to give you enough stamina to build 20 Great Pyramids. The 40 clove garlic chicken sounds like heaven to a garlic fanatic but overkill to the casual garlic consumer. An old French classic, this dish isn’t what you think it is; while it’s full of garlic, the dish is not overpowering. This is due to keeping the cloves intact, with their skins, so that when you are roasting the chicken and garlic, the cloves turn mellow and actually sweet. An added benefit of this recipe is that it’s pretty simple to make. Plus, there’s only a small amount of ingredients. This dish is fantastic served with roasted red skin potatoes and sauteed green beans. Be sure to serve with crusty bread so you can get as much of the tasty juices as possible. - Remove the chicken, placing the pieces in a bowl, and let the Dutch oven cool some. - Cover with the 20 remaining garlic cloves. - Add the wine to the bowl where the chicken was resting, stir to blend with chicken juices, add to Dutch oven. - Cover with Dutch oven lid, and roast for 1 1/2 hours.